Historically the search for the neural bases of behavior goes back a long way. Neuroethology, which is concerned with the experimental analysis ofthe releasing and control mech- anisms of behavior, is a young discipline. Results from this multidisciplinary branch of research, which uses physical, chemical, and mathematical methods, have not yet been extensively treated in textbooks of neurophysiology and ethology. This book is intended as a first attempt to pose major questions of neuroethology and to demonstrate, by means of selected research examples, some of the ways by which these questions are being approached. Inevitably this cannot be a complete and in depth detailed treatment of all of the neurobiology examples, and I realize that such a selection is of a subjective nature. The overall goal ofthe book is to present an introduction. After outlining some of the very basic neurophysiological and ethological concepts (Chaps. 2 and 3), neuroethological questions and methods are demonstrated extensively by means of a particular example (Chap. 4). There are two reasons to choose the visually guided prey-catching and avoidance behavior of the Common Toad: (1) it is a system which I have inves- tigated for about fifteen years and therefore know best, (2) the toad story is one of the most comprehensive neuro- ethological approaches so far. 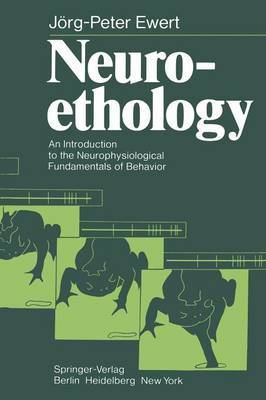 Thus, it is possible here to outline the major concepts of neuroethology and to pose the basic questions.